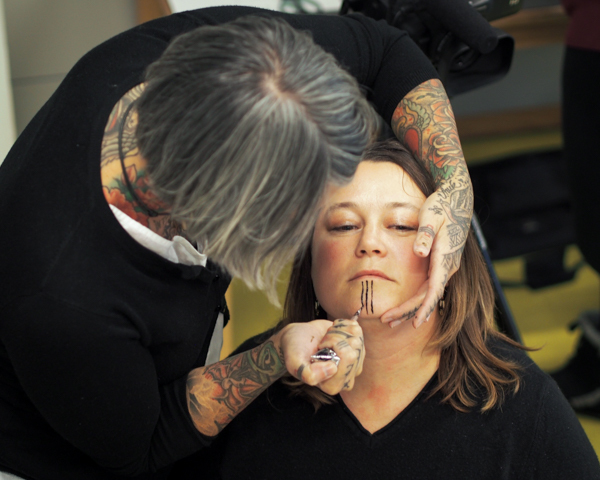 More and more Alaska Native women are getting face tattoos. The traditional practice dates back centuries, but was banned by 19th and 20th century missionaries. Now it’s coming back. Though the techniques and customs were nearly lost, a new generation is using tattoos to reclaim what it means to be a strong native woman in the 21st century. 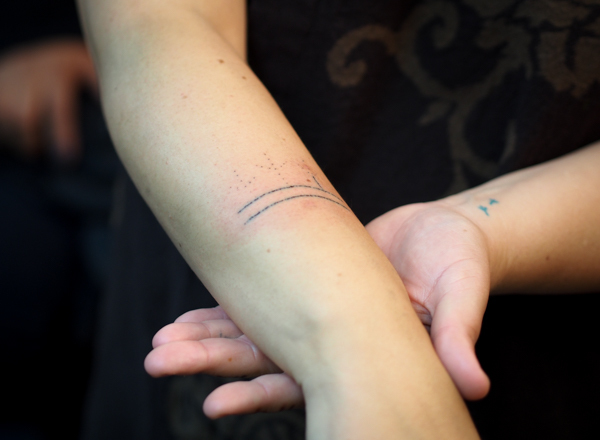 In the backroom of a small Anchorage tattoo parlor, Maya Sialuk Jacobsen used a thin needle to pull an inky thread through the skin on her friend’s wrist. “I use the exit hole as the entrance for the next stitch,” Jacobsen explained, bent over her work as a small crowd milled about, observing. The friend is Holly Mititquq Nordlum, organizer of a week-long series of tattoo-related events called Tupik-Mi. Compared to the sting of a tattoo gun, the stitches hardly register, and Norldum looked unphased, greeting and bantering with observers cycling in and out of the cramped room. Holly Mititquq Nordlum, originally from Kotzebue, sits for a tattoo along her wrist from Greenlandic artist Maya Sialuk Jacobsen during a live demonstration of traditional tattooing techniques. (Photo: Zachariah Hughes, KSKA). Jacobsen is one of the few Inuit women who knows how to give tattoos through traditional methods like sewing and poking in dabs of dye. She’s candid that the equipment has changed: Instead of whale sinew, she uses cotton thread; rather than coloring with soot she uses tattoo ink. But much like rifle-hunting rather than harpooning, she sees her modern tools simply as superior means towards traditional ends: Inscribing the skin with meaningful marks. Jacobsen has spent years hobbling together a body of knowledge about what the practice meant before Danish colonization in her native Greenland almost three centuries ago. Outsiders have looked at Inuit tattoos as having legible meanings embedded within stable rituals, like clear markers signifying marriage or adulthood. But not only did those cultural foreigners import concepts of their own–like marriage–but also a sense of fixity to a practice Jacobsen says was much more fluid and interpretive. “I can’t tell you a triangle means an iceberg,” she explained dryly. That’s partly because the historical record is unreliable, but also because symbols were not nearly so firm. You can’t understand tattooing, she believes, without understanding the lives of Inuit women. While working as a tattoo artist in Europe, Jacobsen was diagnosed with Fybromyalagia, which made it difficult to weild the heavy, vibrating drill that is the trade’s standard instrument. So she started poking, and from there stitching. But as she tried learning more about how Inuit women had traditionally been marked, the few historical accounts all came from European adventurers and missionaries. “I assure you, they did not really know what tattooing was,” Jacobsen said with a wry smile. But then came the mummies: A group of 15th century Inuit women discovered during 1972 at the Qialakitsoq (“little sky”) grave-site in Greenland, preserved tattoos and all. Jacobsen found a book about them, studied the designs, and realized the marks on their foreheads, cheeks, and chins were similar to the tight stitches she’d learned as a girl. It was her first primary source. “I have, like, literature, and then I have, what I call ‘from the horse’s mouth,'” Jacobsen said, “and that is the mummies.” It’s also a well of source material gleaned from interviews with women about Inuit culture, all the way down to comparing notes on sewing and stitching. Tupik-Mi, Jacobson and Norldum’s project, is part of an effort within the Urban Interventions series in the Anchorage Museum’s Polar Lab. Nordlum was introduced to Jacobsen over Facebook by after she couldn’t find anyone to give her a traditional tattoo in Alaska. A friendship blossomed, and they arranged the first in what they hope will be yearly Tupik-Mi events. In addition to a lecture and live tattooing demonstration, the women also hosted a light explanation of tradditional tattoos for high schoolers before letting them apply tube after tube of henna to their appendages. Nordlum squeezed a tight formation of dots and lines onto the back of an 11th grader’s wrist. “She’s making my initials with the Inuit designs,” said Ben Hunter-Francis. The West High junior said he has plenty of time to decide whether or not he’ll get a tattoo. But if he does, he’d like it to be attached to his Yup’ik roots in the Lower-Yukon community of Marshall. Traditionally, tattooing was the province of women: They were the ones who wore them, and exclusively the ones to administer them. But as Nordlum finished Hunter-Francis’s wrist, she explained that the practice isn’t bound in place by history. 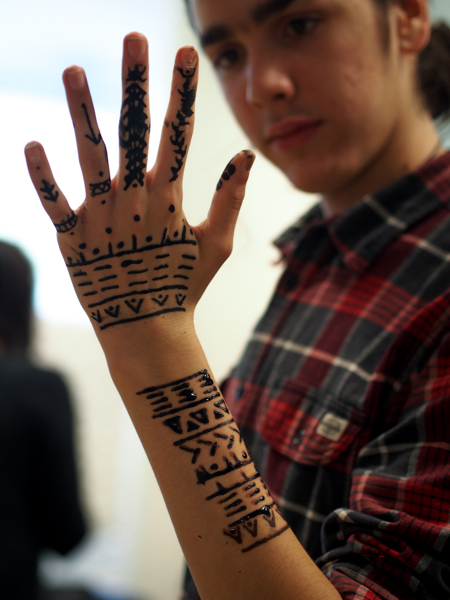 Jacobsen’s son Benjamin came with her from Greenland, and shows off self-administered henna designs made of different traditional patterns, but reconfigured. (Photo: Zachariah Hughes, KSKA). “In modern culture, men getting tattoos is not a rarity. We are contemporary people working in modern times, so although it was a rarity traditionally, now it isn’t,” Nordlum said, not letting up her hold on Hunter-Francis’s arm. If plans go ahead, Tupik-Mi will expand next year to train a handful of Alaskans in traditional tattooing methods. By the third year the hope is to hold workshops in Canada and Greenland, growing tattooing capacity across the high north. “I don’t feel very brave here, because there’s so many of us,” Nordlum said. 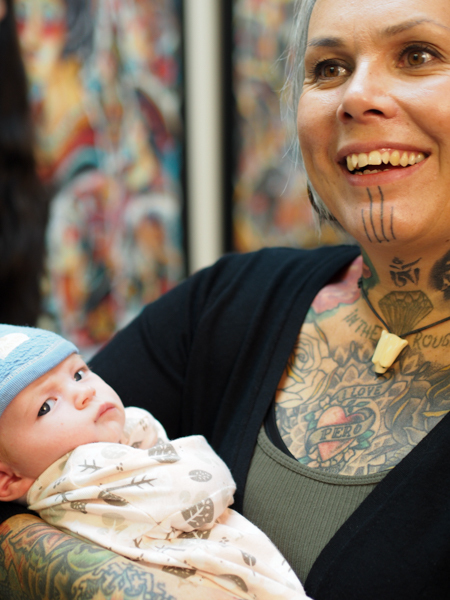 Permanence is part of why tattoos carry so much weight, and Nordlum sees the resurgence in women’s chin tattoos as putting forward a permanent, proud native identity for all to see. Jacobsen had her own chin lines laid down by her partner just two months ago. Soon after the process began, she felt a visit her late mother. Four thin lines that would have normally taken a few minutes took hours. “It was definitely very, very emotional,” she finished. Jacobsen shared that intimate experience with Nordlum just days ago, when dot-by-dot, she poked a tattoo into her friend’s chin.